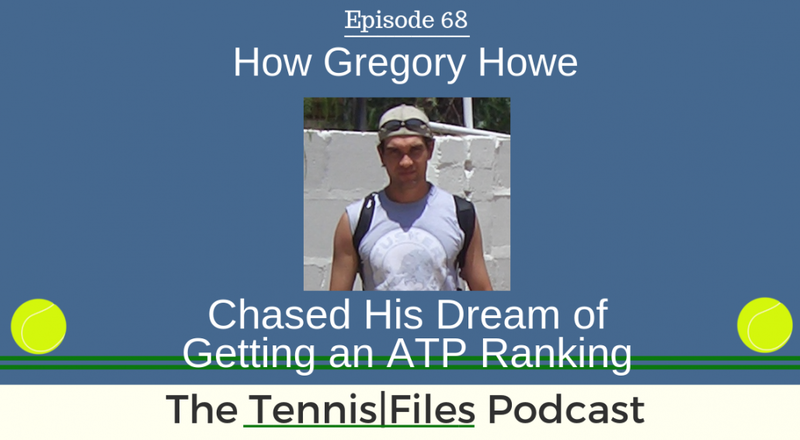 On Episode 68 of The Tennis Files Podcast, I spoke with Gregory Howe about how he decided to quit his job as a 34-year old to travel the world playing professional tennis tournaments in search of an ATP ranking. On top of that, Greg wrote a fantastic book called Chasing Points: A Season On The Pro Tennis Circuit detailing his pursuit of his ultimate dream. I have been reading the book and it truly is a fantastic peek into the life of professional tennis, particularly at the lower levels of the sport where people are struggling to make it to the big stage. Greg set his goal of achieving an ATP ranking almost two decades before he decided to drop everything and travel the world, playing Futures tournaments, finally doing what he set out to accomplish, and then eventually playing Challengers and even ATP Tour events while working a job. You will love Greg's story, as it is a very relatable goal for many players, and he had he stones to go through so much adversity and travel to achieve what he dreamed of doing. I highly recommend you check out Greg's book, Chasing Points: A Season On The Pro Tennis Circuit, as it is extremely detailed and a very entertaining read. It was a pleasure speaking with Greg on the podcast, and I know you'll really enjoy this episode about Greg's journey to achieving his ultimate goal of getting an ATP ranking, no matter what it took. We all dream about getting a pro ranking; even I tried my hand at a Futures event a couple years ago. You can listen to my recap of how my pro tournament experience went here (and check out my amazing cover photo skills while you're at it 🙂 ). [8:25] The peaks and valleys of his junior career. [16:49] Why Greg quit his job to play the pro circuit, even though he had a solid life going for him and despite the risks of doing so.